Censorship in Japan has seen many changes over the last 150 years and each successive system of rule has possessed its own censorship laws, regulations, and methods of enforcement. Yet what has remained constant through these many upheavals has been the process of negotiation between censor and artist that can be seen across the cultural media of modern society. By exploring censorship in a number of different Japanese art forms – from popular music and kabuki performance through to fiction, poetry and film – across a range of historical periods, this book provides a striking picture of the pervasiveness and strength of Japanese censorship across a range of media; the similar tactics used by artists of different media to negotiate censorship boundaries; and how censors from different systems and time periods face many of the same problems and questions in their work. The essays in this collection highlight the complexities of the censorship process by investigating the responsibilities and choices of all four groups – artists, censors, audience and ideologues – in a wide range of case studies. The contributors shift the focus away from top-down suppression, towards the more complex negotiations involved in the many stages of an artistic work, all of which involve movement within boundaries, as well as testing of those boundaries, on the part of both artist and censor. Taken together, the essays in this book demonstrate that censorship at every stage involves an act of human judgment, in a context determined by political, economic and ideological factors. This book and its case studies provide a fascinating insight into the dynamics of censorship and how these operate on both people and texts. As such, it will be of great interest to students and scholars interested in Japanese studies, Japanese culture, society and history, and media studies more generally. 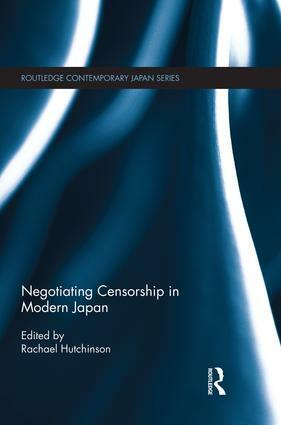 Rachael Hutchinson is an Associate Professor in Japanese Studies at the University of Delaware, USA.